Louis Abdul Farrakhan was born on May 11, 1933 in Bronx, New York as Louis Eugene Walcott. Walcott, who grew up in Roxbury, Massachusetts, excelled as a musician, singer and track star. He attended a Boston-area school for gifted children and was given national exposure at age 14 when, as one of the first African Americans to appear on the Ted Mack Amateur Hour, he won the competition for that episode. After high school Walcott attended Winston-Salem Teachers College for two years and then worked as a calypso guitarist-singer. Walcott joined the Nation of Islam (NOI) in 1955 and changed his name to Louis X and later Louis Farrakhan. Initially he was a follower of Malcolm X, but became a competitor in the period before Malcolm’s assassination in 1965. 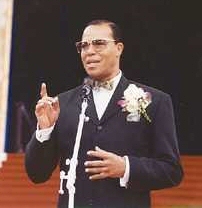 When longtime Nation of Islam leader Elijah Muhammad died in 1975, his son, Wallace D. Muhammad, took control of the organization and repudiated many of his father’s teachings and began the process of integrating the NOI into the orthodox Muslim community, Louis Farrakhan and other NOI followers were displeased with the organization’s new direction. In 1978, Farrakhan and the dissidents reestablished the Nation of Islam. Farrakhan, who emphasizes black self reliance, has preached the wickedness of whites and has been condemned as anti-Semitic by a number of organizations. In 1995, he was one of the principal organizers of the “Million Man March” in Washington, D.C., where African American men celebrated unity and family values. In January 1996 Farrakhan made a 20-nation “world friendship tour” that included stops in Iran, Libya, and Iraq. Farrakhan was critical of the U.S. government, provoking condemnation by U.S. officials. Farrakhan conducted another world tour the following year and met with Palestinian leader Yasir Arafat.